If you’re thinking about doing something extra special for your friends and family this Christmas, then personalized gift hampers are a great idea. There is something wonderful about receiving a gift that you know has been put together with care and attention – just for you. Food, after all, is an incredibly personal thing. Think back to a recent time with family and friends and it is likely to have involved a snack or meal. Food draws out the best conversations. It connects us though nourishment and the caring hands that deliver it. We show how much we care, by the food we choose, really. And it is exactly the same when putting together a Christmas gift hamper. Here, we hand pack all our hampers to order and can add, take away and suggest any collections of food you think will make the person receiving your gift even happier. First pick your basket or box. We have wicker baskets that take between 8 and 40 items. Fancy something different? How about this funky red gift box? Next, think of the types of food the person you are buying for likes to eat. Is there a theme? Do they have a sweet tooth ? Or perhaps a soft spot for afternoon tea with all the trimmings? Want to add more baking mixes? No problem. Or mince pies? We can do that! Finally, and most importantly, tell us what you’d like us to include as your personal message in the hamper. It can be as long or as short as you like. Maybe a traditional Christmas greeting? Keep calm and eat more cake! 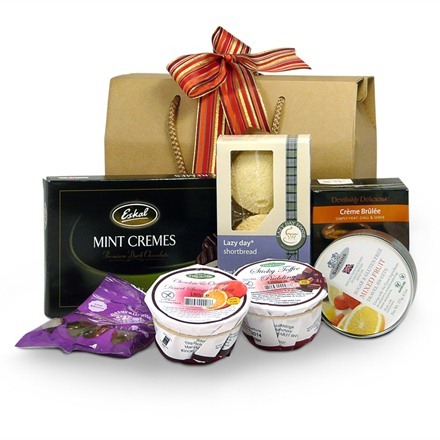 Whatever you decide, you can be sure your hamper is a wonderfully personal gift that will make someone happy. And you can’t get much better than that. Let us know how you’ve personalised your Christmas hampers in the comments below. For exclusive offers, competitions, and the latest Gluten Free Hampers news, make sure you sign up to our blog above and follow us on Twitter and Facebook. Next > The one where The Great British Bake Off went gluten free!